Discussion in 'Guitars in General' started by bluesdoc, Apr 14, 2016. So, for the first time in almost 57 years of pickin' n' grinnin', I get teles! I bought a cheap parts tele here and although it needs A LOT, it's got the tone and responsiveness going and I friggin' GET IT. I can't stop playing it. It makes me happy. So.... I've built lots of parts guitars before, but never a real tele type ax. The question of the moment is, if I don't care about 'vintage' aspects, just the tone, do I really need a folded ashtray style tele bridge? The sides are sort of in the way, but I'm adapting to it. But if/when I replace it with a better one, and it certainly needs better saddles, is there any reason not to go with a flat bridge - no sides? Does anyone think it impacts tone or other aspects of responsiveness? Or anything about hand positioning? Three or four hole doesn't really matter - I can fill and drill just fine. 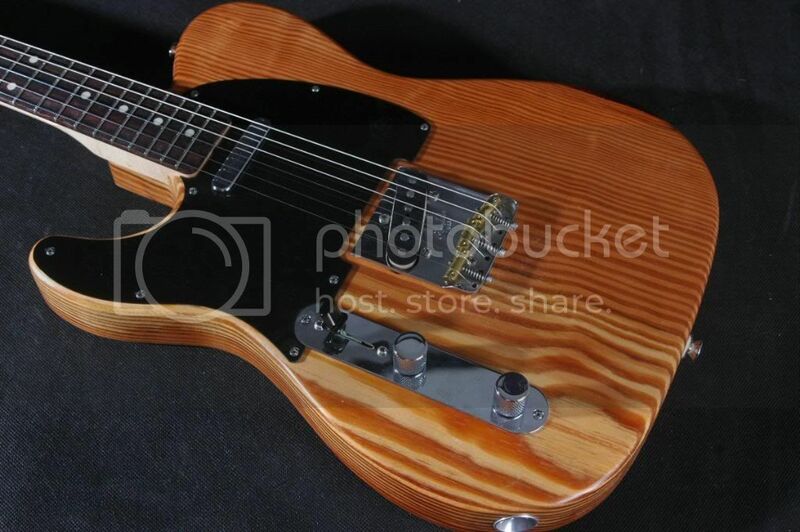 My other musing is whether to just leave well enough alone and buy a nice tele to the specs I think I want. A Kirn maybe? I'm turning 70 this summer - I should go out and buy something pretty for my old self, no? I don't spend money on anything besides guitar gear, and not all that much on that. Haven't taken a vacation in years, but that's another story entirely. Your thoughts, guys? Thanks so much. Bob Longo, shane8, scr@tchy and 1 other person like this. There are companies that make the vintage style bridges with the sides shaved down. Rutters and Glendale come to mind. Both sell top notch stuff. Can't go wrong with either as an upgrade. Pricey stuff though. I'm sure there's a few more too. I don't think the lack of sides will affect the tone, but then again my favorite tele has a 6 saddle toploader bridge on it so what do I know! Rick51, scr@tchy and SPROING! like this. Stick with the one you have, but definitely go with a trimmed bridge. I only say that because it's the route I took. I made a parts tele and thought, like you, that I GET IT! Yes! Telecaster! I bought another one, nicer than the mutt, and it left me cold. So... maybe refine this one for a while longer? I got a Kirn Ol Blackie with the Gotoh bridge and it's awesome. You can send him any bridge you want, as well. The Glendale doublecut is nice for the 3 saddle/no sides thing. A milestone like this is the perfect excuse to buy a nice guitar, don't waste it! I bought myself a guitar when I turned 40 and it was good! So I vote for buying the bridge you want and a new guitar.. If you can afford it, get a really nice tele. Everybody needs a good telecaster. It's the law. Bob Longo, phazersonstun, T Dizz and 3 others like this. I'm gonna go ahead and say you've earned one hell of a tele by now, friend. Get the guitar of your dreams. It twang and snarls with the best of them. Choose your bridge and make it yours, Jon. I seriously doubt you'll ever regret it. For a great very traditional Tele, Whitfills are great. You could just find a beat vintage Fender. I've not played a Kirn, but been tempted by a Barncaster - they're heavy though. As far as bridges, all those named are cool. Keep in mind the originals weren't as overbuilt as some of those boutique ones, so pricier may not give as much of an old school sound. And come visit Nashville on vacation someday - I'll show you around. Lots of Teles 'round here! I had my "Tele get it" experience recently too when I stumbled upon a killer sounding/playing Baja Tele at my local GAS dealer...it just had to come home with me it sounded & played so well. I think it's right up there with the best guitars I've owned over the past 50 years. This also caused me to upgrade my parts-o-caster Tele with Mare pickups...now it sounds great too. However, I'm convinced that a lot of what makes for a good Tele sound is in the 3 brass saddles. But I've also read that the thickness of the bridgeplate plays into that too...so I'd probably keep close to vintage spec. Sometimes even though heavier or thicker might make for "better" construction, it isn't always best for tone. One of the hazards about building a guitar though...you just don't know what you'll end up with until after the fact. And I hear you about the bridgeplate lip getting in the way but I've adjusted to it...so I'll probably leave mine as is. When I have something that sounds so good, I just hate to mess with it and go backwards . Rick51 and jimmyj like this. I am always stunned when I play my Kirn Barnbuster. Just an amazing guitar. I went with a Glendale saddle/bridge and finally settled on Stuart Blackguards. If it helps. I have a flat callaham with the vintage style saddles and three holes. For me it's a beautiful bridge feel as well as tone wise. Not to mention it's a really well made part. I'd say get one and try it. Yup Jon, weight can be an issue with guitars. However, I'd be surprised if my Baja is even 7.5lbs.. Too bad we're not closer, I think you'd get a kick out of my Baja. At the store, within a few notes, my eyes bugged out and my jaw hit the floor thinking how can this kind of tone & playability happen at this price point . However, good luck with the Tele project...and the ablation! I used to buy into the idea that a Tele had to have an old school, three brass saddle bridge. Then I played some Teles with six saddle bridges and realized how many great Tele players with great Tele tone have used six saddle bridges as well. After that, I've been more than happy with my Gotoh bridges. I love the stock bridge on my Reverend Eastsider T with stainless saddles. I snap and twang all day long. For 75 bucks get the Joe Barden with compensated brass, amazingly good manufacturing, easy to intonate and after a/b it against the Glendale which is also an amazing bridge with brass saddles as options I found them to be very identical to my ear. Either way both are worth the money. But 6 block style saddle bridges I have played sounded dead on awesome as well, just depends on the look and or comfort factor in the end. Saddle material and plate thickness have more to do with the tone, but so does what pick you use. Yup, there's the classic argument about having 2 strings on a saddle increases the downward pressure on the saddle, making for better sustain and tone. Makes sense...but whatever works for you. And, while the intonation isn't perfect on a classic Tele bridge, I find it's close enough to my ears to not be concerned about. My 10th fret C chord sounds good and I don't play much above that . Again...whatever works for you. I have a '55 RI Tele and recently got A '60s Baja. Both are great teles. I put the Callaham vintage compensated saddles on both and since they are similar enough to stock Tele brass saddles I don't hear any tone difference, just better intonation. However at one time I had the heavier Callaham bridge plate with the cutout on the '55ri and it noticeably increased the upper mids on that guitar. The neck pickup in particular was more aggressive sounding and not as smooth.